USC Nursing Science staff and students will partner with community groups to offer free health checks to Sunshine Coast homeless and marginalised people on Saturday 23 March. 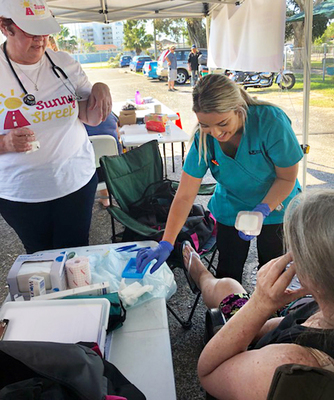 The University of the Sunshine Coast mobile health clinic will be at the Maroochy Neighbourhood Centre for Homeless Health Care Day from 10am to 3pm. Bronwyn Doyle, who coordinates clinical placements for USC Nursing Science students, said the event was a wonderful opportunity for students to give back to the community, gain experience and network with care organisations such as Blue Care and Sunny Street. Ms Doyle said the USC clinic would provide blood pressure monitoring, skin integrity checks, wound care, mental health assessments and other basic health monitoring.